I asked for import substitution and bought it. Well, if it says, the forecase is ALC back like a racket like ZLC. What? What? It was that kind of feeling. I feel like they are using other special materials. Both good and bad are interfering with each other. Fore likes ALC, but back likes the feeling of ZLC! ! I felt it was not a racket to use as the last person I asked for. I think the important shot feeling is quite different from pros and cons. There is no other design so beautiful racket. The performance is the combined feeling of Butterfly's Mizutani ZLC and Timorbol ALC. Although the board thickness is thin, it flies considerably. We recommend that you use it together with Tenaji. Usako	（Experience：１１〜２０ years）	A little difficult but very good! Originally I used Inner Force ZLC, and the back was stable, but I found this racket on the net where I was troubled because I had no power in the foreground because I had no power. 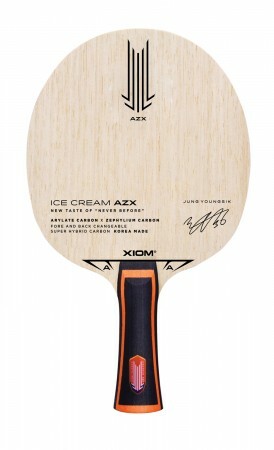 Because this racket is different in the special material in the fore and back, it was difficult until I got used a little differently from the feel at impact, but it is very good if I get used! I think the merit is still the stability of the back and the power of the fore. After all the fly flew straight to Alilate Carbon only and I felt it was very easy to do the counter and drive smashing! The bag is an outer with Zellum carbon (ZLC carbon), but it was impressive that the ball had better spin and rotation than I thought. I think the disadvantage is that it is a little difficult racket if you do not understand this racket. It may be a bit difficult until you get used to the ball is slow and a little difficult because the fore has a sense of grasping while the ball is early to leave the ball. But the performance itself is a very good racket, so I think it is worth watching.